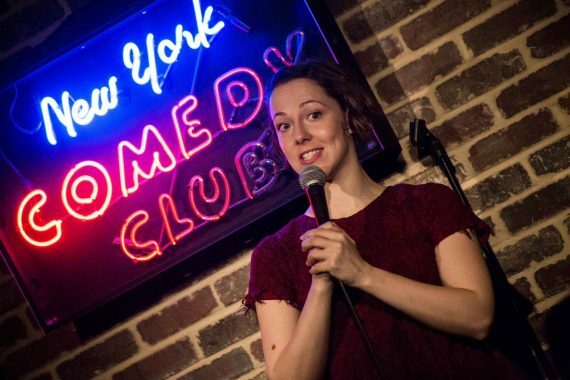 We sat down with the hilarious comedian Camille Theobald at the New York Comedy Club. She is a regular at most of the comedy club in NYC. She is a rising star has been featured in the New York Post, Time Out NY, NBC News and Elite Daily. She has appeared on MTV, in Kevin Spacey’s Masterclass, as the voice of Amazon Prime’s travel series Beyond Moscow, indie films in the New York Indie Film Fest, Long Island Film Festival, Brooklyn Film Festival, Queens World Film Festival, and National Geographic. 1. What other jobs did you do before starting stand up comedy? When I first moved to NYC at 18 I surprisingly convinced this Soho restaurant to hire me even though I had no experience. I was the worst waitress but they were desperate so didn’t fired me. After being there 8 months I started to feel bad because I was so inept at it. I couldn’t calculate tips correctly and would forget orders literally two seconds after someone told me, yet somehow I can remember an hour of material. Makes no sense. 2. How did you know you wanted to be a comedian? I honestly didn’t know I wanted to be a comedian until I tried it. I just knew I had to be on stage in some capacity. I had been a dancer, singer, actor, tried improv, sketch comedy, then finally stand up comedy and fell in love. Although I enjoy doing all forms of comedy, making a room full of people laugh is the best feeling in the world. 3. If you weren’t doing comedy, what would you be doing? In an alternate universe where I never tried comedy I would probably live in The mountains and run a coffee shop. I love coffee so much it’s ridiculous. 4. Where are some of your favorite places to perform? I’ve had a great time performing in Fairfield and Hartford Connecticut, Denver Colorado and of course New York City. 5. Who are some of your favorite up-and-comers in the comedy world? Comedians who’ve been really killin’ it lately are Chanel Ali, Usama Sidique, Chris Hamilton and Abby Feldman. 6. What’s the best advice you’ve ever gotten? You can’t control whether people book you or not. The only thing you can control is your funny so just focus on your material. 7. When did you feel like you were a pro comedian? It seems ironic to even have the words professional and comedian next to each other. This job is too fun to feel like a real profession. 8. How often do you perform comedy per week? Right now, on a good week it’s about 8 but I plan to double that by the end of the year. 9. What are your favorite comedy clubs that you perform at? New York Comedy Club was the first place I did stand up comedy so it will always be my number 1. Then I’d say Caroline’s UCB east and Creek and the Cave. 10. How do you deal with hecklers? Each heckler is a little unique but often they think they’re helping the show so I try not to trash them. With a relevant come back home I let them know that I’ve got it handled and we don’t need their input. 11. What advice would you give your younger self? Stop caring about what people think and just do what you think is funny. I started when I was 20 so I was easily influenced and fell into a lot of traps that held me back. 13. What do you talk about in your act? I talk about my fears, my family (which are basically the same thing), crazy things that have happened to and around me. 14. How did you develop your style of stand up? When I started to do stand up comedy I became obsessed with George Carlin and tried to write like him but it wasn’t that good because I was trying to be someone else. So I started observing how I am with my friends and how I make them laugh and used that to build structured jokes. The goal is just to be myself on stage I don’t know if that’s really a style but it’s honest. 15. Who were your influences growing up; both from the world of comedy and elsewhere? When I was young my brothers and I would tease everyone in our family and each other, it’s how we dealt with awkwardness and pain. I also watched The Simpsons and Seinfeld pretty much every night as a kid (as long as I wasn’t grounded from the TV for whatever reason) so that really influenced what I found funny. 16. I love to interview comedians, Can I ask what happens when you are in front of a crowd, and no one laughs? That’s never happened…Jk I wish. For real though if I tell a joke and no one laughs I move on to the next one unless there is weird tension or bad energy then I will address it. Sometimes it takes just calling out the off thing about the room to get people to loosen up and feel comfortable to laugh again. 17. What made you decide to be a comedian? It’s the only time where I feel completely myself. Were you born funny? That’s an amazing visual, a baby jumping out of the womb and roasting the everyone. I don’t think anyone is born anything. We are all heavily influenced by our environment and the people around us. If you’re surrounded by funny people or a family that doesn’t take life too seriously you will most likely end up with a good sense of humor. 18. When can people see it? I’ll be going to Salt Lake City, Denver Colorado, Durango Colorado and Albuquerque New Mexico. Specific dates and venues are on my website. I host a podcast called Healthy AF where I interview health professionals and comedians about how they stay healthy. So many health and wellness podcast put me to sleep so I decided to try and make health and wellness more entertaining.